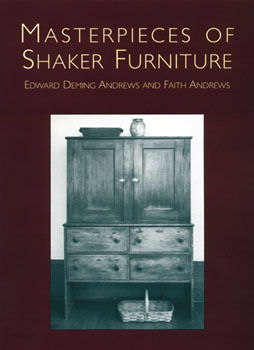 This book, written by noted Shaker authority Edward Deming Andrews, examines in-depth the distinctive quality of Shaker craftsmanship. The nearly faultless furniture of the Shakers - uniquely beautiful, quietly refined and striking in its simplicity - is shown here in 83 crisp and clear photographs of chairs, rockers, dining tables, chests, desks, and many other domestic pieces. Also, three informative articles that are included present fascinating discussions of Shaker origins, their communal villages, religious faith, and other aspects of Shaker life. This excellent book beautifully matches its subjects, and is valuable for anyone with an interest in Americana, hand woodwork, Shaker life, and the masterpieces of Shaker Furniture.